BRENDAN MORRISSEY: Hi, I’m Brendan Morrissey, founder of iDyslexic, and this is Assistive Technology Update. JOSH ANDERSON: Hello and welcome to your Assistive Technology Update, a weekly dose of information that keeps you up-to-date on the latest developments in the field of technology designed to assist individuals with disabilities and special needs. I’m your host, Josh Anderson, with the INDATA Project at Easter Seals Crossroads in beautiful Indianapolis, Indiana. 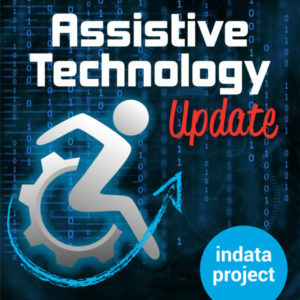 Welcome to episode 401 of Assistive Technology Update. It’s scheduled to be released on February 1, 2019. On today’s show, we are very excited to have Brendan Morrissey to talk about iDyslexic. We’ve got kind of a public service announcement for anyone using the Lime scooters or rideshare scooters, reminding them to think about others. We’ve also got a really interesting story from CES and some of the devices that could be used as assistive technology or just some devices to help all of us, not just individuals with disabilities. Thank you so much for tuning in today and let’s go ahead and get on with the show. Folks, our first store comes as a bit of a public service announcement. This actually comes from ABC news in Australia. The title of the article is, “Lime scooters are causing stress for Brisbane’s visually impaired community.” It’s by Jessica Hinchcliffe, and it talks about the electric scooters, a few companies have them. What they are, is they’re e-scooters. You come up, scan an app, and you take the scooter around. If you live in any sort of a large city or close to one, they might be there. Here in Indianapolis, we have two companies that do these and we started to see them around. What the story really says is just to be smart and think when using these. They talk to some visually impaired residents, and it’s about how it’s very hard to detect the scooters coming up from behind and that the scooters are just dumped anywhere across the city. I actually saw a news story not long ago here in Indianapolis where individuals were writing these on the sidewalks — which they are not supposed to be. They are only supposed to be on the road. But they were actually leaving the devices in the curb cuts, so folks with wheelchairs and other disabilities couldn’t even access the sidewalk because these were just being put in the way. Really take this as a bit of a public service announcement. If you are someone who uses these lime or other rideshare scooters, please just think about other individuals. Don’t leave them in the way. Don’t sneak up on people, because they may have a visual impairment and not know you’re coming. Just think about others when you are using these. I guess we should probably think about others when using or doing anything in our lives. I’ll put a link to this story so you guys can check it out. This isn’t something that just happens in Australia. This can happen anywhere where these scooters are. If you are using these, just be aware of other individuals. Be smart when you are returning them and put them back to get them out of the way to keep the roadways open so the access can be had by all. When this show goes live on February first, I will actually be at ATIA walking around and finding some new assistive technologies, talking to folks. but it got me thinking about one of the other big electronic shows, and that would be CES, the international consumer electronics show. What’s really neat about this is CES is all different kinds of technology. They bring forward all kinds of new ideas. Some of that is assistive technology, or at least has some different attributes that can be considered assistive technology. I found an interesting interview called the 22 innovative technology startups to watch at CES 2019. It’s at Forbes by Jean Baptiste Sue, a contributor. It talks about some different things that he was looking forward to and actually seeing at the show. The show has wrapped up by now, but these 22 startup finalists are going to be pitching to Richard Branson’s extreme tech challenge. A lot of these things aren’t available yet. They are in the works. But I wanted to take a little bit of time to talk about a few of them that just because it’s very cool stuff that is out there. They have already selected the three finalists in — and I’ll let you know at least two of these are the finalists. But I want to take time and talk about all of the different things. Again, there is a lot more assistive technology there. I know some different assistive technology makers had their things out there. But these are the ones highlighted in this article, and I want to go through some of those and share them with you. I’ll put a link in the show notes not only to the story itself but to each of the different items that are talk about so that they are really easy to find and easy to learn about on your own. The first one I want to talk about is something called Lynq, and that’s L-Y-N-Q. this is one of the three finalists that are still competing. Lynq is essentially a location tracker. What it does is you can pair up to these, and it will sit there and tell you how far away you are from the person and in what direction they are located. What’s really cool about this is it does not use a cell phone, does not use a cellular signal, it does use GPS but does not need to be connected to anything except for another one of these Lynqs. you can do up to 12 people, can all be connected. You can set up a home base with it, so that an individual, if they wander off, can use the Lynq to find their way back to that home base. It also has some other really cool feature that I think would really help folks. It has a safe zone. It will alert the other people linked to it if someone gets out of the safe zone. I think of folks with elopement or things like that, whatever you want to go out in public. Maybe your child or someone else with a disability that has a bit of a tendency to wander off, this helps you find them and them to be able to find you. It’s a very simple interface, has just one button on it. It has a carabiner that can connect to things. You can keep it with folks. This is something that’s made for folks to use when hiking, skiing, doing outside sports. When I was younger, I used to love to go to music festivals. If I were sitting there with my friends and went to the restroom, I never found them again. I don’t know why, but for some reason I could not figure out where in the world I ever was. This would be a great way to do it. Also if you think about at big events. Here in Indianapolis, we have the Indianapolis 500. When you are they are, especially when you are with that individual who maybe has a problem finding people or a problem with elopement, cell phones don’t work really well. You have 200,000 people. It just stretches the network. Something like this should be able to easily find out exactly how far away they are from you and in what direction to go. That one is called Lynq, L-Y-N-Q. I will put a link in the show list to get over to Lynq, a very cool device. The next devices from Padrone, P-A-D-R-O-N-E. What they made was a ring that is essentially a mouse. Instead of using the mouse for your computer, the touchpad, or something like that, this is a ring you put on your pointer finger and be able to sit there and tap your finger and move it around and use that as a mouse. [INAUDIBLE] individuals with any kind of mobility challenge, we are always looking for different ways of computer access. If I maybe don’t have use of one finger, it doesn’t matter which one it is. Or I have limited wrist, shoulder, arm movement, maybe this is something that could be used in order to access the computer here I’ll put a link for this one in the show notes. A very cool and another way to get computer access. The next devices the loop earplugs. Earplugs, you might say, Josh, what do earplugs have to do with assistive technology? If you really think, there’s a lot of noise out there. These were created to help you at a nightclub, a concert, a place with a whole lot of noise. Think of those folks with sensory disabilities that are overwhelmed by all the noise and everything in the world, especially in cities and areas where there are a lot of people. What these do is they fit inside your ear. They are 3D printed, so they let in some of the sound but block out about 20 decibels. For someone who needs complete noise canceling, these are going to be what they need. But it could be a really good accommodation for somebody to who just needs to quite everything down a little bit and maybe take some of that noise and filter it. They don’t look weird. They actually look like a ring. If you think about folks that have spacers in their ears and things like that, it looks like one of those but actually goes in the ear canal and sits in there. They are not very expensive, $30. It could be a very cheap accommodation for someone who still needs to hear what’s going on around them but maybe just needs that volume cut back a little bit. Very cool and we will put a link to loop in the show those. The next one is the Y-Brush, which is a different kind of toothbrush. That’s “Y,” the letter, dash brush, not W-H-Y brush, because we all know why we should brush our teeth. Y-Brush is an auto cleaning electronic toothbrush. If you ever had a mold of your teeth down, it looks a lot like that, a little thing you bite down on. In 10 seconds, it can clean all your teeth. If you think about an individual who may be doesn’t have the capacity to brush their own teeth, with this device, it can be put in the mouth, 10 seconds, it’s done, you flip it over for the bottom teeth, 10 more seconds, it’s done. Less than 30 seconds, all the teeth are brushed. I’m sure it would not be hard to build something to where the individual could come up to this in their wheelchair or another way and easily be able to use this device without the need for assistance. When we think about trying to be independent and do a lot of things on our own, this Y-Brush could really be helpful to help folks just be able to brush their teeth. I also think about kids. It could easily help kids. Trying to get them to brush their teeth for two minutes is almost impossible. If you could have them do it in 10 seconds, they might even go over sometimes. Very helpful device, much like a lot of the other ones we are talking about today. This one, I think, is still in the development phase but is something we might see down the road. It could help those folks with ADL’s. The next devices also one of the finalists in the extreme Tech challenge. It’s made by ActiveProtect. What it is, it’s a hip protection belt. What this belt does is you wear it, it detects a fall, and as the individual is falling, it actually deploys airbags to help the individual when they hit the ground to soften that blow and hopefully protect the hips from breaks, fracture, and those kinds of things. As someone who has had family members that have had falls it hurt their hips, their pelvis, broken these pieces, it can be pretty devastating and take someone out of commission for a decent amount of time. Very cool that this device actually, on its own, can detect that fall and popout those airbags. Think of all the people’s lives that have been saved or injuries of orders from the airbags and cars. It’s very need that this wearable technology of airbags is getting there. And I wonder where that will go, if it will eventually get to where you can almost have an airbag suit, so any kind of fall. If you think of folks who may be have difficulty being ambulatory, of course our seniors and that kind of thing, this could be a really helpful device. This is one of those three finalists. We will put a link to that in the show notes. Only thing about assistive technology, I would have to say the white cane is probably one of the most recognizable pieces that has changed mobility for a lot of individuals who are blind or visually impaired. One of the finalists here at CES is the WeWalk. Now, the WeWalk looks a lot like the white cane. The handle just looks a little bit different. What the hymnal does is, it actually will tell you if there are things in front of you and above the chest. The white cane normally just does everything at the bottom, but this does everything a little bit taller. If you think of just something getting out, people around, or anything like that, it can find those. The other thing that is really cool is the WeWalk connects to your phone. If you think about directions, turn left at the next light, do these kinds of things, a lot of that can be set to come through by vibrations. This device can vibrate and tell you where you’re going, no need to hold the white cane in one hand and your phone in the other. All the information can be sent straight through. It looks like you can also find your direction, your position, it’s compatible with android and iOS. They are starting to change some different things and even get it a little bit more integrated with different apps. It’s got about five hours of battery life. In it looks like it can even be voice controlled. There is also a touch area that uses the same gestures you are used to having in the accessible programs on iOS and enjoyed. Just a very cool all-in-one device that’s very close to a device that’s been around for a long time, but just thinking about it in a new way. It’s called WeWalk and we will put a link to that in our show notes. The final device we will talk about on this list is perhaps my favorite, not just because of what it can do but also what it reminds me of. I don’t know if any of you have ever heard of the Babel Fish, but let’s hear a good description of the Babel Fish and I’ll tell you how that compares to what we are about to talk about. NARRATOR: The Babel Fish is small, yellow, leech-like, and probably the oddest thing in the universe.it feeds on brainwave energy, absorbing all unconscious frequencies and then excreting telepathically a matrix form from the conscience of frequencies and nerve signals picked up from the speech centers of the brain. The practical upshot of which is if you stick one in your ear, you instantly understand anything said to you in any form of language. BRIAN NORTON: Of course the Babel Fish is not real. That’s from hitchhikers guide to the galaxy. If you’ve never read the book or seen the BBC show or even the movie, I definitely recommend checking it out. What I wanted to talk about is Waverley labs has something called the pilot smart earbuds. What these do is essentially what the Babel Fish did. You put these in your ear, and they connect to an app on your phone, and they give you real-time translation. I know it’s not quite assistive technology, but if we think communication is a huge thing, it can be a big barrier for everyone who just doesn’t speak the same language as another individual. These come in a two pack. What you can do is put one in your ear, give one to the individual you’re talking to, you both connect them to your smart phones, and you get real-time translations. You can sit there and have a conversation with the individual even if you do not speak the same language. I believe they have between 15 different languages, up to 42 different dialects that they can understand. They have about four hours of battery life. They have a portable charging case, you can always put them in. Of course you can take voice calls and also get wireless streaming. They are very small. They actually fit into your ear. Just think how cool that is that you can have that translation coming through. It says here that that information is sent up to the cloud, AI translates it for you, and sends it back down, all within one and a half to two seconds. The person’s lips are going to be moving, within two seconds you’ve got that translation. How cool is that, but you can sit there and have this conversation with the individual in real-time? Just think of all the collaboration that you would be able to do and all the other ways that you could be able to talk to folks and really just work with them and no longer would they would be a barrier. Those are the Waverley labs pilot. Why they didn’t name it the Babel Fish, I will never know. It’s really fun to see them make that. We will put a link to that over in our show notes. Those were just a few of the cool things that were out there at CES. Hopefully someday here we can get the show out there and find out some of the neat things that will be able to help folks with disabilities and special needs. Since we are at ATIA, I’ll do everything I can to find all the new stuff and bring it on back to you and talk about it in the weeks to come. Since we are on the subject of neat, new technology, our next guest, Brendan Morrissey from iDyslexic is on to talk about that program and some of the cool things it can do. There are many individuals out there that struggle with ADHD and dyslexia. Although these disabilities can affect as many as one in 10 individuals, the diagnosis can leave some students feeling alone, different from their peers. Coordination between students, parents, teachers, and case workers can be a little overwhelming at times. Our guest today, Brendan Morrissey, is the founder of an app called iDyslexic. It works as a social network for individuals with dyslexia and ADHD, as well as their parents, teachers, and caseworkers. Welcome to the show. BRENDAN MORRISSEY: Hi, Josh. Nice to meet you. JOSH ANDERSON: Nice to meet you as well. Before we get talking about iDyslexic, can you tell our listeners a little bit about yourself? BRENDAN MORRISSEY: I’ll give you the two minute version. I left school at 15 because I was dyslexic and ADHD, didn’t have a clue what was going on. I want to work with my dad, but I found a love for music. I play guitar for a living and I signed with Geffen Records in 1991, signed the biggest deal in the world and toward with Guns & Roses and the Chili Peppers for years. I moved back to Ireland and [INAUDIBLE] started consulting with tech companies, Amobi, Vertu. And then I got a lucky break in 2004. A friend of mine introduced me to a small company in Palo Alto. It turned out to be Facebook. I came back to Ireland. Facebook encourages teaching people about social media, and saw the value in building communities online, so I started building my own. I am across 16 tech companies right now, everything from education to adventure to AR to safety, talent, discovery, and music. That’s the short version. JOSH ANDERSON: That is the short version. You opened up a lot of doors I would like to explore there but we only have so long. That’s definitely a different road than most folks take. Let’s talk about why we have you on the show today. Tell me about iDyslexic. BRENDAN MORRISSEY: My son is dyslexic and ADHD also, so I built this for him, just to show him that he’s not alone the last couple of years. He’s 13 now. He was diagnosed when he was a lot younger. I used to go to meetings every six months with his caseworker and teacher for a couple minutes and it just wasn’t enough for me to manage him daily. So I built iDyslexic to let him connect with his teacher and caseworker in school pick I set up a secure portal where I could manage his homework and calendar and its activities. It lets him see that there are other children in school with dyslexia and his town, and he can zoom out and see in this country. We launched four weeks ago and it has changed people’s lives already. We are getting messages all over the world from Australia, New Zealand, America, from parents saying that children are looking at the posts and seeing that there is some light at the end of the tunnel, that there is a community to support them. There is no global social network for dyslexia, so we are the first. JOSH ANDERSON: There really isn’t. The student, the parent, the teachers, the caseworker, all those folks can converge at once to talk and work together? BRENDAN MORRISSEY: Yes. We have a secure classroom. The apps are free to use where parents can connect with other parents and connect with dyslexic associations. It’s a secure portal that the parent pays us $20 a year for. That’s where they connect to the school daily and we managed their education that way. JOSH ANDERSON: So there’s really no cost to use it, but if you want that secure portal, that’s the $20 a year? Is that correct? JOSH ANDERSON: Perfect. You said that students with dyslexia can meet other students with dyslexia and use it as a social network as well? BRENDAN MORRISSEY: Yes, a full social network. If you think of it as Instagram where they just post daily about their lives, and then they can connect with dyslexic associations, with professionals, mentors, they can get help. There’s lots of advantages. They came messages directly that they can just share their daily lives with dyslexia. A lot of the dyslexic platforms around the world, all they seem to do is share about celebrities having dyslexia, Richard Branson or Orlando Bloom or somebody look like that. We have real people every day. Like last week, we had a message from a lady in New Zealand. Her 12 year daughter, her self-esteem was very low. She started reading our posts, and overnight she saw a big change because she saw that there was opportunities. We are showing her that 50 percent of people who work in NASA are dyslexic. She never knew this before. I’m pretty excited that it’s working already. JOSH ANDERSON: That’s great. Like you said, sometimes if you just see celebrities, it’s hard to connect, it’s hard to put yourself in the situation. But if you can see that normal folks and folks with those kinds of jobs have that, that can really help out, especially with that self-esteem. BRENDAN MORRISSEY: Exactly. We are just focusing on the positive. A lot of press is focused on the negative about dyslexia and ADHD, and we are all about the positive. We are showing kids that when we mapped the human genome, they figured out that is not attention deficit disorder but is actually super focus. That’s why Google, Microsoft, or all picking these kids with dyslexia and ADHD, because of that super focus. We are just showing them that there is a future. Is not as bad as they think. They can use that super focus as a superpower to their advantage. JOSH ANDERSON: Just focus in the right way and it becomes a much better health than a hindrance. JOSH ANDERSON: And you said your son has been using this app as well? BRENDAN MORRISSEY: Yes. We only launched four weeks ago so we are still in trial. We’ve got a couple thousand users already so it’s growing organically. The parent uploads the IEP file into the secure classroom, so that saves the teacher time in school. It’s just to show kids that this won’t hold him back. There was nothing like that before. I just want him to know that he’s not alone. The minute he sees posts from people around the world, he’s saying that he’s not alone. It’s actually working. He was in the car the other day and he was telling his friend about this super focus. He’s definitely reading it. It’s working. JOSH ANDERSON: Very good. And you said this is available all over the world right now? BRENDAN MORRISSEY: Yes, global. We are doing languages next. Right now we are just in English. We are pushing it languages next month. JOSH ANDERSON: Very good. What’s on the horizon great what are you guys working on next? I know it’s only been out a few weeks. You don’t sound like the kind of guy who likes to sit still. BRENDAN MORRISSEY: There’s a lot of things. Like with the education, there’s five educational company that we run. In the last couple of years, I found a purpose beyond profit. We are working on platforms for teen counselors to connect all teen counselor patients. We are working on iAutistic, same principle as iDyslexic, to connect autistic children. We are working on iHelp for suicide prevention. We are working on a thing called standup charity that’s going to help the homeless, where we can geo-fence locations and push notify them to show where they can find a shelter every night. We built gifting into it as well so we can gift a sandwich or haircut directly to their phone. So there’s lots happening. IDyslexic is the first of the social impact. JOSH ANDERSON: That’s a great idea. You are using social media for good and being able to link people to what they need and help out. That’s very cool. JOSH ANDERSON: If our listeners want to find out a little bit more about iDyslexic, where would they go? BRENDAN MORRISSEY: They can go to iDyslexic.com. The apps are on the app store, free to download. Please add me as a friend and I can chat with you about what’s happening and show you how to use it. JOSH ANDERSON: Very cool. You kind of touched on it a little bit, but tell me a couple stories about some of the folks that have been held by the app. BRENDAN MORRISSEY: We have parents connecting. This is blowing their mind a little bit. Because they are so desperate. My poor wife has to deal with two of us in the house. It’s for parents to connect with peers also and learn how to deal with situations. Those connections are happening. The self esteem of the children is growing already. We are seeing children come on the post on the app. I always felt that children would open up on these social networks, that they won’t open up on Facebook or Instagram about their conditions. But if it can be spoken somewhere that people love, and professionals are also there, then they will actually start talking about their condition, which is actually happening. It’s everything I thought it would be. JOSH ANDERSON: Folks, we will put a link down in the show notes over to iDyslexic.com. Make sure to check it out on the app store and Google play. We will do our best to get Brendan back on whenever the other programs, and check in with him sometime in the future to see how things are going. Thank you so much for being on the show today. BRENDAN MORRISSEY: Thank you. Nice to meet you.